The NHL trade deadline is Wednesday. Here are some dos and don’ts to guide you through the busiest day of the year. The NHL trade deadline is Wednesday. That means if you’re a general manager, you’re probably really busy right now. Your scouts are working overtime. Your fans are demanding action. Your phone is ringing off the hook, or at least it would be, if anyone still used phones that had hooks. So, uh, why are you taking a break from all that to browse Grantland articles? My guess is you’re looking for last-minute advice to guide you through this hectic time. And luckily, I’ve got you covered. Because while nobody can know for sure what will happen tomorrow, a look back through the history books can offer us at least a few clues. So before you get back to work, my NHL GM friend, here are some dos and don’ts to guide you through the busiest day of the year. Do: Target guys with really violent-sounding names. If you can pick up a guy with scary-sounding first and last names, everyone will be so intimidated that they’ll spend decades referring to it as the greatest trade deadline deal of all time, even though it’s clearly not. Historical Precedent: In 1980, the New York Islanders traded Billy Harris and Dave Lewis to the Kings for center Butch Goring, a move that to this day is referred to as the “gold standard” of trade deadline deals. I mean … it’s the name, right? “Butch Goring.” That’s pretty badass. It sounds like a name George Carlin would have made up for his NRA bit. So I’m going to assume that’s why we’re all still raving about a trade involving a solid but not especially spectacular veteran. Well, that and that the Islanders went on to win four straight Stanley Cups after making this deal. That probably helped. But this was an Isles team that already had Mike Bossy, Bryan Trottier, and Denis Potvin — and the Islanders were also the reigning Presidents’ Trophy winners. They were already pretty good. Did Goring help put them over the top? Probably. Would we remember this deal as fondly if his name had been Percival Cuddlepants? Probably not. Do not: Trade the best player your franchise has ever had to the league’s most talented team. Generally speaking, you should probably avoid trading your all-time best player under any circumstances. That seems like a solid strategy. But if for some reason you decide you have to send your star packing, maybe do the rest of the league a favor and don’t send him to a team that’s already completely stacked. 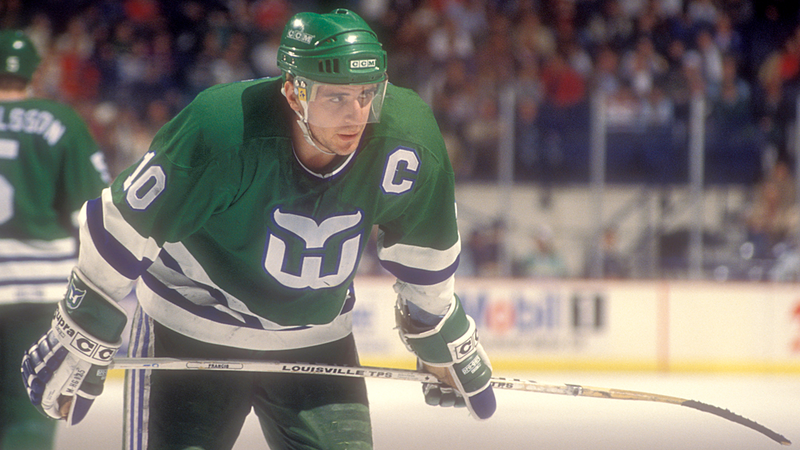 Historical Precedent: At the 1991 deadline, the Hartford Whalers sent former captain and all-time franchise leading scorer Ron Francis to the Penguins as part of a six-player blockbuster. Pittsburgh was already absolutely loaded, with a star-studded roster featuring players like Mario Lemieux, Jaromir Jagr, Paul Coffey, Mark Recchi, and Kevin Stevens. All that talent hadn’t quite clicked yet, and they were just three games over .500 the day the deal was made. But adding Francis was the tipping point, as he helped the Penguins to back-to-back Stanley Cup wins in 1991 and 1992, and went on to record four 90-plus-point seasons in Pittsburgh. It’s worth mentioning that at the time, the trade didn’t seem especially uneven. The Whalers did get John Cullen, who was fifth in league scoring at the time. But in hindsight, it was one of the more one-sided deals in league history. Cullen only lasted one full season in Hartford, and the Whalers never won another playoff round before moving to Carolina in 1997. Do: See if you can get a 600-goal scorer as a throw-in nobody will ever remember. Hey, it can’t hurt to ask, right? Historical Precedent: Everybody remembers the 2000 trade that sent Bruins legend Ray Bourque to the Colorado Avalanche for three players and a first-round pick. The deal resulted in Bourque finally earning his first Stanley Cup the following season in a moment that literally every hockey fan loves. It’s probably one of the most famous trades ever. Which is why it’s odd that virtually nobody remembers the other member of the 1,300-point club who went to Colorado in the deal: Dave Andreychuk. And that’s despite then–Avalanche GM Pierre Lacroix calling Andreychuk the “greatest sniper” of all time when the deal was announced. Granted, Andreychuk played a total of only 31 games in Colorado, scoring just four goals. At the time, he seemed like he was washed up. But he’d go on to record four more 20-goal seasons, and captained the 2004 Lightning to a Stanley Cup. Today, his 640 goals are the most of any eligible player who’s not in the Hall of Fame. Do not: Flip your first-round bust for some other team’s first-round bust from the same draft. Sometimes first-round draft picks just don’t seem to work out. It’s frustrating, but it happens. And when it does, it may be tempting to try for a do-over by trading your guy for another team’s first-round disappointment from the same draft — especially if the guy you’re acquiring was taken nine picks higher. Uh, don’t do that. Historical Precedent: The 1991 NHL draft was pretty stacked. It featured Eric Lindros as the consensus no. 1 pick, as well as future Hall of Famers like Peter Forsberg and Scott Niedermayer. But it also had its share of busts, and five years after the draft was held, it looked like the Penguins and Canucks had each wound up with one. So at the 1996 deadline, they decided to swap. The Canucks sent the bruising winger they’d taken seventh overall to Pittsburgh in exchange for the one-dimensional scorer the Penguins had taken 16th. The deal worked out OK for Vancouver, since it turned out it had just acquired a guy who’d become the franchise’s captain and all-time leading goal scorer: Markus Naslund, who’d pot 346 in 11 seasons. But as for the Penguins, they wound up with Alek Stojanov, who’d play a grand total of 45 games for them, scoring two goals. Do: Try to cram as many future Hall of Famers into the deal as you can. Historical Precedent: On deadline day in 1989, the Capitals and North Stars hooked up for a four-player deal that included both franchises’ all-time leading scorers, in Washington’s Mike Gartner and Minnesota’s Dino Ciccarelli. The two forwards had combined for 697 goals when the deal was made, and would go on to score 619 more afterward. As if that weren’t enough, the North Stars also acquired Larry Murphy in the deal. He was already a nine-year veteran at the time, and he’d play 12 more seasons. Murphy, Gartner, and Ciccarelli would all end up in the Hall of Fame. The fourth player in the deal was hard-nosed defenseman Bob Rouse, who went to Washington. He didn’t make the Hall of Fame, having to settle for a 15-year career and a pair of Cup rings. What a bum. Do not: Trade the tubby kid with the famous dad. Addendum to this rule: If you do, you’d better win the Stanley Cup or else you’ll never hear the end of it. Historical Precedent: Leading up to the 1988 deadline, Flames winger Brett Hull was enjoying a reasonably productive rookie season. But his reputation as a lazy, out-of-shape floater made it easy for the Flames to send him packing for some veteran help. Hull was dealt to St. Louis along with Steve Bozek in exchange for veterans Rob Ramage and Rick Wamsley. Oops. Hull scored 41 goals in his first full season in St. Louis, then followed that with an eye-popping 228 in his next three. He’d go on to score 714 more goals over an NHL career that included eight All-Star appearances and the Hart Trophy in 1991. Luckily for the Flames, they went on to win the Stanley Cup in 1989, which is the only reason this trade doesn’t show up on every “worst deals of all time” list. Just most of them. Do: Remember to ask for something in return when trading a future Hall of Famer. So you’ve decide to trade a veteran star to one of the league’s best teams. Cool. Hey, you did make sure to ask for something back, right? As in, anything at all? No? Oh. Historical Precedent: At the 1997 trade deadline, the Maple Leafs traded Larry Murphy to the Detroit Red Wings. That’s it. That’s the whole trade. Well, that’s not completely accurate — the Leafs also agreed to pay a chunk of Murphy’s salary. And in exchange, they received “future considerations.” Those future considerations turned out to be the joy of watching Murphy help the Wings to back-to-back Stanley Cups, and … absolutely nothing else. Do not: Make a trade just for the sake of making a trade. Really, don’t do this! And be sure to tell us you’re not going to do it. And then after you don’t do it, be sure to remind us you didn’t do it. Basically don’t talk about anything else for at least a week. Historical Precedent: Literally every GM, every single year. We get it, you guys. You don’t make trades just for the sake of making trades. Message received. You can shut up about it now. Do: Acquire Dominic Moore in exchange for a second-round draft pick. There has never been a player in NHL history whose trade deadline value was more firmly established than that of journeyman checking line center Dominic Moore. Historical Precedent: At the 2009 deadline, the Leafs traded Moore to Buffalo for a second-round draft pick. Just before the 2010 deadline, the Panthers traded Moore to Montreal for a second-round draft pick. Just before the 2012 deadline, the Lightning traded Moore to San Jose for a second-round draft pick, but also had to throw in a seventh-round pick, because obviously his value is plummeting. Moore now plays for the New York Rangers, so presumably Glen Sather is standing by now to take your calls. Let’s just say you probably won’t have to spend a long time haggling over the price. Do not: Trade your washed-up veteran star to a division rival without first making sure he’s not a zombie. Yeah, we know, he’s already in his late thirties. Sure, right, he’s probably only got another year or two left, max. And yes, he’s spent most of the season shuffling around listlessly while mumbling about brains. But just to be on the safe side, maybe run a quick blood test before you make the deal. Just in case. Historical Precedent: In 1999, the Blackhawks traded three-time Norris winner Chris Chelios to the Red Wings for young defenseman Anders Eriksson and a pair of first-round picks. It seemed like a steal for Chicago — at 37 years old, Chelios was surely on his last legs. That was a lot to give up for a guy who couldn’t have many years left. Well, “many” is relative term, and in the context of a 14 billion-year-old universe, I guess you could say Chelios was almost done. But by NHL standards, he was just getting started. At the age of 40, he was a first-team All-Star and Norris nominee. At 44, he played for Team USA at the Olympics. At 45, he became the second-oldest player in NHL history. At 46, he was nominated for the Masterton. At 48, he was still in the NHL, appearing in seven games for the Thrashers. Chelios finally played his last NHL game on April 6, 2010. Five days later, that fresh-faced youngster he was traded for, Anders Eriksson, did the same.